There will be an infinity war between the digital banks in India before the Avengers: Infinity Wars hits the theatres in India. Let’s begin. Since India went digital there has been many changes that went great. Everything is now linked to your Aadhar Card from your Sim Card to Pan Card. Leaving the cards aside, even the banks went digital in India. 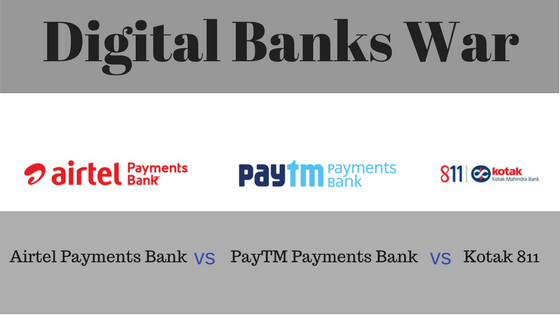 I am here reviewing these digital banks up to an extent that you can get an idea about if you really need it if so which one to opt for. These are three digital banks, I’m going to discuss. We all know about Bharti Airtel. It is one of the leading telecom operators in India. In a meanwhile, they first introduced the wallet and then moved to Airtel Payments Bank. To open an account, you simply need your Aadhar Card and your biometric data to verify. After this, your account will be opened. However, Pan Card is a must for the one who is planning to do transactions exceeding ₹50,000. Let’s keep all this aside and take a look at its features. Charges for Airtel Payment Bank are given here. Recently PayTM introduced its payment bank. It was an Electronic Wallet before arriving of Payment Bank. However, there is just an addition of Bank in newer app update and the electronic wallet remains and works as same as usual. The bank account number is alotted with your registered phone number on PayTM except you need to add 91 at the beginning. For example, your phone number is 9876543210 so the PayTM bank account number will be 919876543210. Risk-free deposit as they only deposit in government bonds. Up to 3 withdrawal limit in a month. Charges for transfer of money are given here. However, UPI, NEFT, IMPS remains free of charges. Coming in the competition, Kotak decided to join too. A new digital bank but they claims to be the first Downloadable Account for a particular reason. They also happen to be giving the interest rate p.a, the highest among all digital banks above. Let me give you some features of it too. Almost open the account instantly just by Aadhar and Pan Card along with biometric for KYC. Zero Balance account that means no maintenance of balances. Scan & Pay within App. Visit nearby Mahindra Bank to deposit the amount in your digital bank. Thanks for reading, sharing is caring. Share it with your friends and family. Drop the Digital bank you currently have account in the comment box below so I can see which bank you choose!